Fashion Revolution Week, the annual global campaign calling for a fairer, safer, more transparent fashion industry, will run from Monday 22nd – Sunday 28th April 2019. Fashion Revolution Week 2019 aims to encourage people to recognise their own personal impact and value quality over quantity. It will demand a change in culture where we nurture dignity in work because we cannot afford to live in a world where our clothes destroy the environment, harm or exploit people and reinforce gender inequality. This year Fashion Revolution Week will highlight how the future fashion industry must respect both people and planet with fair and decent work, environmental protection and gender equality. 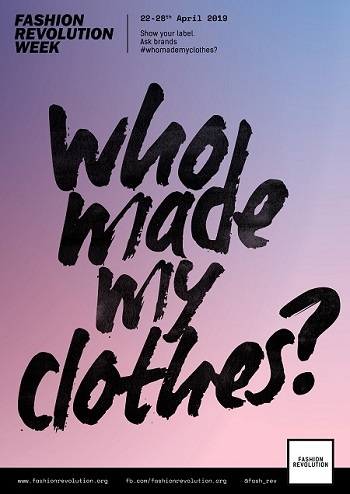 From Australia to Brazil, Uruguay to Vietnam, more than 275 million people are again expected to take part in Fashion Revolution Week by asking brands #whomademyclothes. Research shows that garments are among the items most at risk of being produced through modern slavery. The campaign will be supported by Jasmine & Melissa Hemsley, Wilson Oryema, @dresslikeamum and Stories Behind Things to urgently demand a fashion industry that conserves and restores our environment and gives people, especially women, a voice. Over 1,000 Fashion Revolution events will be held in more than 100 countries around the world, from catwalks and clothes swaps, to film screenings, panel discussions, creative stunts, open studios and workshops. While the sustainability of the fashion industry is increasingly under scrutiny, human rights abuses, gender inequality and environmental degradation remain rife. Research shows that garments are among the items most at risk of being produced through modern slavery. Sexual harassment, discrimination and gender-based violence against women is endemic in the global garment industry, where women comprise 80% of the global workforce. Global textiles production emits 1.2 billion tonnes of greenhouse gases annually, more than international flights and maritime shipping combined. We are producing 53 million tonnes of fibres to make clothes and textiles annually, only to landfill or burn 73% of those fibres.